Lots of people have been in touch with me through emails, letters, tweets and Facebook about yesterday’s debate in Parliament over the Conservative Government’s Welfare Reform and Work Bill. Given the way events have unfolded over the past week and how it has been reported in the media, I can understand the genuine concerns that people have been raising. Let me say at the outset that I am fundamentally opposed to the changes which the Conservatives are trying to introduce which will hit the vulnerable and worsen poverty in our country. Some of the measures they are trying to bring in were contained in last week’s Budget and some in the Welfare Reform and Work Bill that had its Second Reading in the House of Commons yesterday. Despite being called a Second Reading of the Welfare Reform Bill, Monday was actually the first time it was debated in the House of Commons. Once past its Second Reading, the Bill is debated by MPs, line by line, in what are called the Committee and Report stages of the Bill. After amendment at those stages, Bills eventually come back for a final yes or no vote in the House of Commons. That final vote is called a Bill’s Third Reading. After that it goes to the House of Lords for further debate. You track the Bill online here. I am sorry if the above seems technical or if I am telling you things you already know. Knowing the process through which Bills are debated by Parliament is, however, important to understanding what happened – and what did not happen – on Monday. Many of the Tax Credit and other changes which the Tories are trying to introduce were contained in the Budget rather than this Bill, and Labour MPs were clear in voting against that last week. 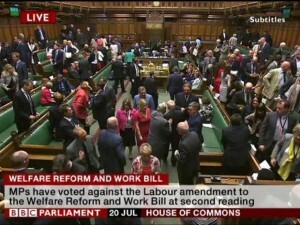 In relation to the Welfare Reform and Work Bill on Monday, Labour proposed a “Reasoned Amendment” which said that the Bill should be rejected because it will make poverty worse and hit the vulnerable. If passed, that amendment would have stopped the Bill going any further. As far as I am aware, every Labour MP who was able to be in Parliament on Monday voted for this amendment. However, as the Conservatives have an overall majority in the Commons our amendment was defeated. After the defeat of the Labour amendment, the Commons then had to vote on the Bill’s Second Reading. Having put forward our amendment, the official Labour position was to abstain on the Second Reading itself. The reason given was that as the Bill contains some things with which Labour supports (for example the principle of expanding apprenticeships), as well as things with which we profoundly disagree. Therefore the view of Labour’s current Leadership was that we should abstain on the Second Reading vote in order to move further amendments at Committee and Report stages in the autumn. As you know, 48 Labour MPs took a different view, arguing that we should vote against the Bill at a Second Reading as well as voting for our own amendment. I have sympathy with the latter view and I made my views known before the vote. It was not that I thought that voting against Second Reading rather than abstaining would make any difference in practice – the Government would have drafted in enough of their MPs to ensure that it passed anyway, just as they did to defeat our amendment. Rather I was concerned that that by abstaining we may create the wrong perception of Labour’s position. I think events have proved me right about that. However, as a member of Labour’s Frontbench Team as Shadow Roads Minister, I share collective responsibility for the decision to abstain on the Second Reading vote. As Backbenchers rather than Shadow Ministers, the 48 Labour MPs who voted against Second Reading are not bound by the same level of collective responsibility in the Parliamentary Labour Party. The reality is, though, that this is not the end of the story as far as the Welfare Reform Bill is concerned. The Bill now moves to Committee and Report stages where Labour will offer more amendments to try win big changes to the Bill. If we are unsuccessful, we will still be able to vote against the Bill at its Third Reading Stage. Assuming the Government uses its majority to vote down the Labour amendments when Parliament returns in September, I cannot see myself doing anything other than voting against the Bill at Third Reading. In the light of the above, I hope you will see that my abstention on the Second Reading does not reflect any kind of sympathy for the Bill and that, along with others, I will use my vote to fight what the Conservatives are doing as the Bill continues its passage through Parliament. I realise that a lot of the above has not found its way into the headlines – either in the traditional media or on Twitter and Facebook. However I hope that this provides a clearer explanation of why I voted as I did on Monday and why I will continue to oppose the Tories assault on young people, working families, people with disabilities and children in low income households. If you would like more information on the Welfare Reform and Work Bill or it how it may affect you, please don’t hesitate to get in touch.